Plus: Is It Time To Buy In Brazil? I moved to Uruguay’s Punta del Este in 2006 and enjoyed this beach community until we moved on to Colombia six years later. And, in all of my overseas experience, Uruguay still holds top honors for quality of life, cultural richness, and for having a people who are hardworking, honest, and friendly. Punta del Este is hardly undiscovered; it’s one of the world’s best known and most popular beach resorts, drawing the rich and famous from far and wide. Carlos Slim—the world’s richest man—has a place here, and you’re also likely to bump into the likes of Michael Caine or Shakira while moving about town. Punta’s real estate market has outperformed every dire prediction for the past 10 years, including my own in 2012. It blew off the Great Recession, and it’s now ignoring the Argentine meltdown. This is a world-class, world-renowned real estate market with loads of international buyers, and it continues to tack on solid gains year after year. Here are a few basic attributes that make Punta del Este a solid, high-quality market. Intrinsic value: This is a naturally beautiful place. Situated on a point jutting out into the ocean, its miles of surrounding beaches are wide, long, and beautiful. Lifestyle: Punta del Este offers a variety of lifestyles. The town itself is home to more fine-dining establishments than you’ll find anywhere, offering cuisine from all over the world—although the fresh-caught seafood is their signature fare. There are high-rise casinos, big-time shows, and concerts. The shopping is world-class, with everything from small boutiques to modern shopping malls. Yet, if you go just half a mile away, you’ll find yourself in a quiet residential setting with large lawns and beautiful homes. A bit further away and you can live in a rural, wooded setting yet still be close to all that the town has to offer. Within 15 minutes of town, you can even own a farm. Infrastructure: Local government puts a lot of money into keeping things nice in Punta del Este in order to keep the visitors coming back. The water is drinkable, the streets are clean and well maintained, and the beaches are raked and cleaned daily. New wooden walkways traverse the dunes here and there for people who may have difficulty walking in the sand. Liquidity: People come by the hundreds of thousands to visit Punta del Este every year, and a lot of them have an eye out for property. Most are wealthy. This huge amount of international traffic is found few places in the world, and it results in thousands of properties being sold every year—just what you need if you’re concerned about resale. But these amenities aren’t free. Punta del Este has the highest day-to-day cost of living in Uruguay, and virtually everything is somewhat more expensive than in Montevideo or the interior. That said, I still believe that the cost of living in Punta del Este is justified by the excellent quality of life here. 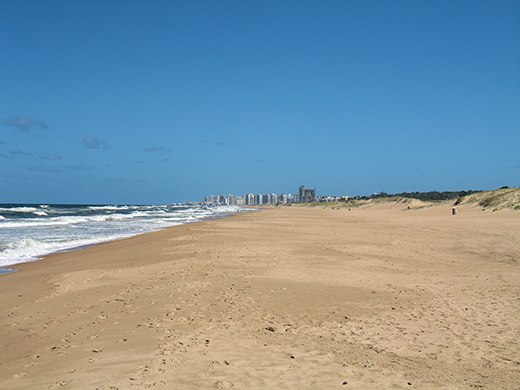 The Punta del Este area includes about 15 miles (25 kilometers) of beach, with the town itself situated on a peninsula in the middle. Heading west from the peninsula toward Montevideo, you’ll find the beach known as Playa Mansa, while heading northeast toward Brazil is Playa Brava. Between these two stretches of beach, the Brava side is favored by vacation homeowners and is perhaps a bit more prestigious. The beaches are wide here and bordered by large dunes, the sand is fine, and the waves are big (“brava” means “fierce” in Spanish). The Mansa side has more year-round residents who enjoy beautiful homes at lower prices. The beaches are narrower, and waters on the Mansa side are relatively calm (“mansa” means “gentle” or “tame” in Spanish). The peninsula is the actual town of Punta del Este. Here you’ll find the exclusive shopping and the area’s best restaurants, casinos, hotels, and high-rises. This is the sector where you can live without a car. 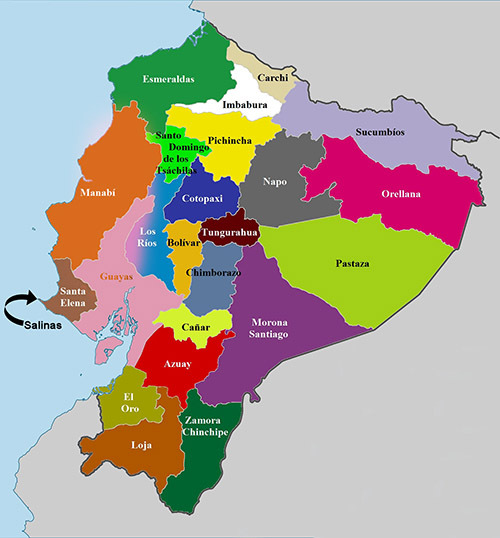 On the Mansa side, I think Pinares is the best area for those who are looking for more permanent living as opposed to owning a rental or vacation property. You can rent properties here, but the area is better known for its quiet wooded streets, larger nonvacation homes, and lower property prices. Punta Ballena is the end of the Punta del Este area on the Mansa side. Its tasteful homes and quiet streets are well worth a look. What’s more, there’s a resort in the woods nearby called Club del Lago, which offers a three-circuit, 20-hole golf course, tennis club, and lakeside restaurant. On the Brava side, San Rafael is among the most desirable of the Punta del Este “suburbs.” It has a small commercial area consisting of about a block’s worth of shops, including a small grocery and a pharmacy. My former home of Rincón del Indio offers homes on treed lots, and the area maintains a unique rural feel. The beaches here are separated from the rambla by tall, rolling dunes, and most of the year the beaches are deserted. When I first came to Uruguay in 2004, it qualified as a budget destination, but that only lasted a couple of years until the falling U.S. dollar made it more expensive for dollar-holders. Current exchange rates are helping. Since starting to rise last year, the U.S. dollar has gained 50% on the Uruguayan peso, which has reeled back the cost of living. But, over the past few years, inflation has been creeping upwards and is now high by Latin American standards. During the year that ended last week (June 30), the rate of inflation was 8.53%, while 2014 closed at 8.26%. 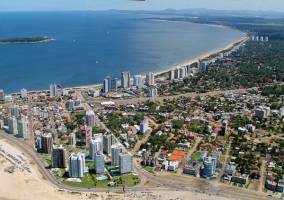 But, strangely, Punta del Este is still popular despite the increased cost of living. In some cases, wealthy property owners from around the world simply don’t care about the costs. But others—while still conscious of costs—put quality of life ahead of budget. Still others want to invest in a solid, international property market. Notably, Uruguay attracts people concerned with individual sovereignty and international diversification. It’s one of the world’s best locations for establishing a second residency, a second citizenship, and an offshore financial presence. In fact, I personally use Uruguay’s banking system for U.S. dollars, euros, and Uruguayan pesos. 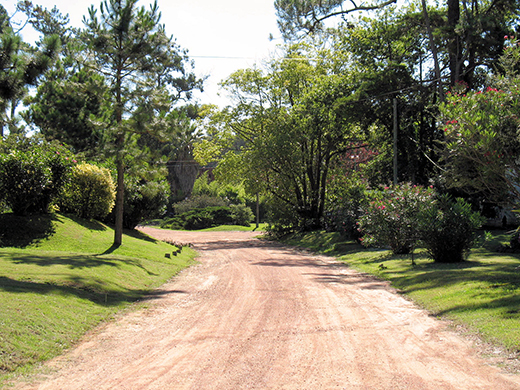 So, while it’s not as inexpensive as it was, Punta del Este is still drawing plenty of traffic and property buyers. I’m listing a handful of properties below that represent good values and are fairly affordable. But keep in mind that you can get a lot more expensive if you like. I saw one apartment on Playa Brava that was listed for US$7.5 million… and it was sold within two weeks. In Pinares, we found a two-story home for sale with 1,291 square feet (120 square meters) of living area, including three bedrooms and two baths. It’s totally remodeled and equipped for year-round living, with furnishings, alarm system, and heating. The asking price is US$210,000. Also in Pinares, a newer two-story home built in 2014 is on the market, with 1,183 square feet (110 square meters), two bedrooms, two bathrooms, and fireplace. The asking price is US$195,000. At the center of San Rafael, there’s a good-sized, two-story house for sale with 1,721 square feet (160 square meters) of living area including three bedrooms, two baths, maid’s quarters, garage, and nicely landscaped yard. The asking price is US$250,000. In Rincon del Indio, we found a small house on the market with 1,399 square feet (130 square meters) of living area on a single floor, with three bedrooms, two bathrooms, rooftop terrace, covered patio, and garage. Built in 1990, this one is conveniently located five minutes from La Barra and 10 minutes from Punta’s peninsula. The asking price is US$230,000. On the peninsula, directly across from Punta del Este’s port, there’s an older apartment (1970) for sale in move-in condition. It has 689 square feet (64 square meters), with two bedrooms, two bathrooms, a wonderful water view, and garage parking. It’s just steps from the many port area clubs, restaurants, and fresh seafood vendors. The asking price is US$210,000. Close to Punta’s popular Emir beach on the peninsula, we found a 753-square-foot (70-square-meter) apartment for sale. Built in 1989, the property includes two bedrooms, two bathrooms, and sea views. The asking price is US$169,000. Directly on the Playa Mansa’s waterfront road, there’s a nicely designed 646-square-foot (60-square-meter) apartment for sale. It has two bedrooms, two baths, beachfront balcony, and garage space, right across the street from Mansa beach. The asking price is US$185,000. This market has been a solid store of wealth for a long time. We posted solid gains during the last recession, while the rest of the world was wringing their hands. Also, I spot-checked a couple of areas for recent performance. The average cost per square meter on the peninsula has gone up 7% over the past seven months, headed for an annual increase of 12%. In Rincón del Indio, asking prices have gone up an average of 15% per year over the past three years. 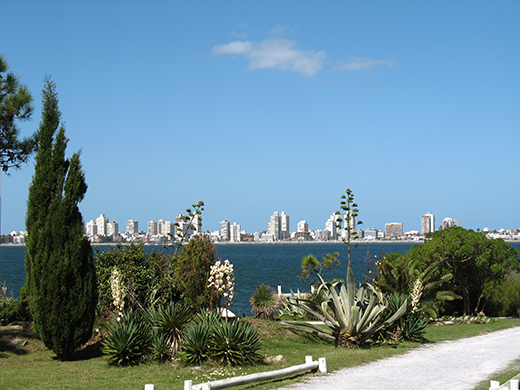 But, property prices aside, Punta del Este offers a lifestyle that’s hard to beat. I felt like I was on a permanent vacation while living here. And, among the world’s top-end resorts, it still remains among the most affordable. I’m wondering what your take is on Brazil. I’ve been back and forth to Rio, working for the past year, and the economy seems to be faltering; the Brazilian real is down to three reais per U.S. dollar, and it seems that property values have depreciated when you get away from Rio. I would like your opinion on buying in Brazil. I’ve been considering looking along the beach areas north and south of Natal. When I sold my house in Brazil, the exchange rate (luckily for me) was 1.72 reais per U.S. dollar. Today, it’s 3.13 reais per U.S. dollar, which means the dollar has 82% more buying power than it did then, in 2010. That’s a huge discount for the dollar-holder and an excellent opportunity for those who are interested in buying in Brazil. I like the areas Greg is considering, north and south of Natal. And I think anyone interested in Brazil should be scouting there now. The exchange rate is presenting us with great prices, and, with any luck, an uptick in U.S. interest rates later this year will provide yet more buying power via an even-stronger dollar. Do you need to invest the full minimum amount in Malta, for example, or can you finance part of the purchase in order to get residency? I doubt that you could get financing in Malta without prior residency and sufficient Maltese (or EU) income to qualify. Some countries permit you to borrow a portion of the funds from outside their country (Spain allows this), but I don’t see that in Malta’s program. However, another alternative that I failed to mention in the original essay on residency is renting. Malta allows foreigners to obtain residency if their annual rental contract exceeds 9,600 euros (in Malta) or 8,750 euros in Gozo or areas south of Malta.